Your playing round looks to have come up with something interesting, from little acorns and all that. I would be intrested in either version but I prefer the bi-compax version. Yep, either of those please. On a related note when do you expect the have the auto version of the 40 available? I'd be at the front of an orderly queue for either of those. Very interesting, I bought the PRS40 because I was very keen on the shape, place of the crown and angles in the case. Will there be enough space on top to make room for decent sized pushers? I prefer the bi-compax as the tri fills out the dial too much for me. I would be very interested by the Version B. I like the proportions, the dial is well balanced. 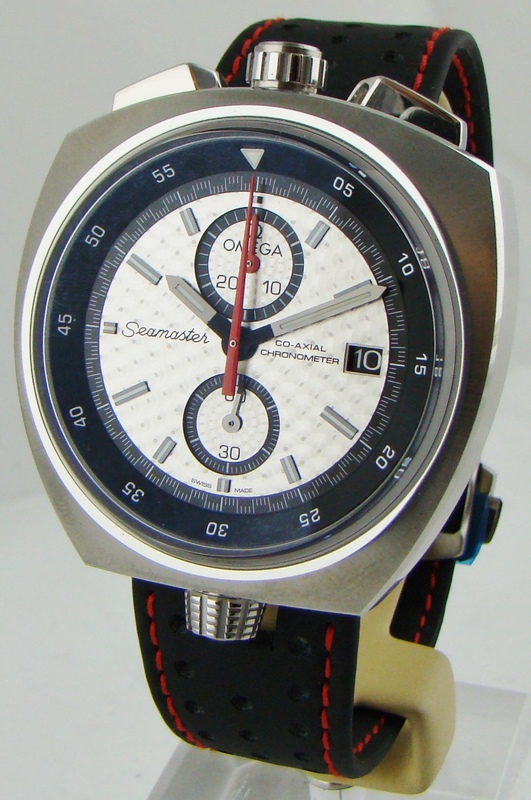 I think if you could find a quartz movement with centre seconds chrono that would be great. 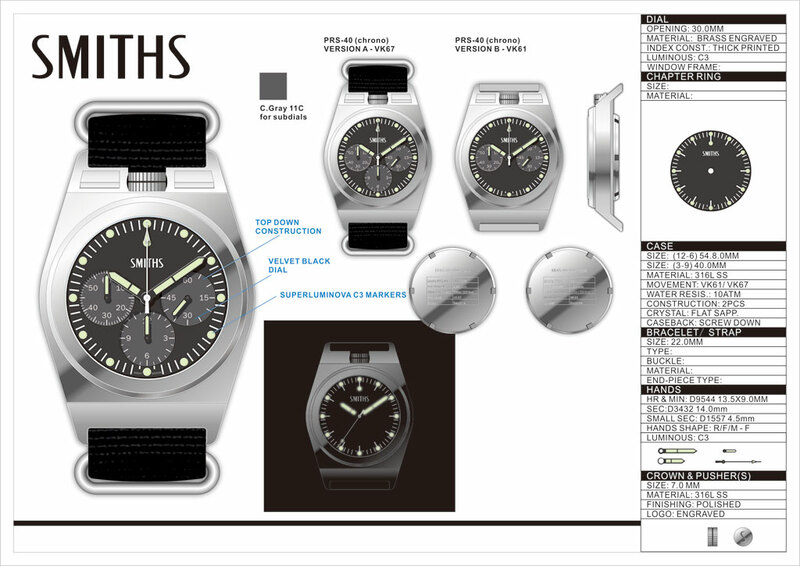 Subdials seem to contradict the simplicity of the case design. I like the idea of a central hand chrono a lot! Does something like this help the readability on the current design? Looks good. Version B I reckon. Looking good. Personally B option would be my choice! Neither. Too much frontage for too little dial. Also, not in the market for a Chrono. I like that the crown isn't in the normal positions though. The effort is to be applauded, but I will probably be in a minority of one again! Version B but with plain round hour plots, I reckon. The additional batons on the plots make the dial look too busy. Last edited by learningtofly; 12th September 2018 at 16:16. ^^^ Good shout from Tony! Version B or Version A with date at "6"
No date, just like the PRS40, dial is busy enough as it is. 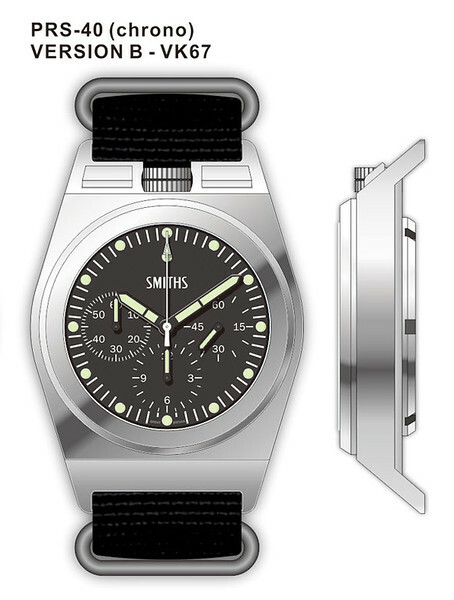 If it helps, with a 60 minute sub-dial for the chronograpph, the 1/2 hour hashes for the 12 hour sub-dial can also be removed. ps - I know we all know what you mean Dave, but you surely mean a centre-minute and second chrono, not just a centre second one, which all chronos are. Details, details. I got a C in maths 'o' level. Nice OCD, but lose the 'target' and make the little aeroplane thing orange please. Oh, and I think the lume plot at 12 needs better differentiation. 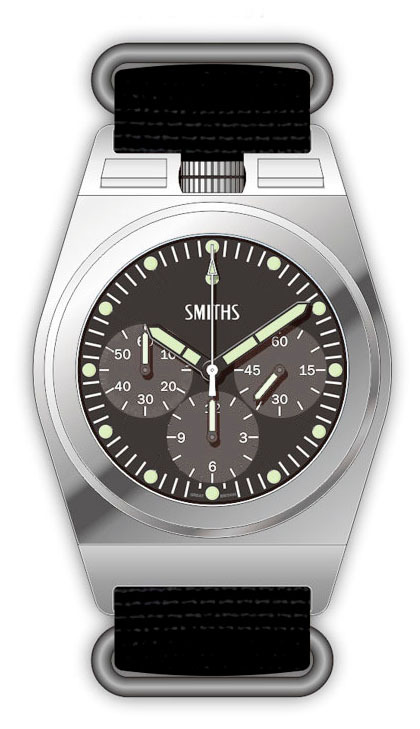 Maybe a contrasting lume colour. Last edited by seikopath; 12th September 2018 at 18:14. I love the tricompax, I always do, but how about bicompax with a date (on the larger side for those of us beyond 50) at 6. Conversely I also love the mission timer approach (though even the EZM1 has a date). If we're using UG terminology, that's a Uni-Compax and a Compax in the OP. They both look a bit busy to me. Because it's a bullhead, it would need a custom date wheel printing and because of the size of the movement, the date would sit too low. A quick and dirty with Dave's suggestions. I really like the centre minutes chrono layout. So much easier to read at a glance. The only thing that would improve on it for me would be the addition of an hour sub-dial as often a max 60 mins recording period is too short. Sweet whip dog. My favourite yet. Not a big fan of the big triangle though. Eddie has steadfastly resisted a mission timer so far, but I like it. Perhaps the chrono-second needs to match the chrono-minute a bit better?? Black hand, orange tip perhaps?? Like these a lot. I agree that the plain round hour markers help make the dial look less busy. Looking forward to see how this progresses. For what it is worth (nothing most likely), I don't see a great deal wrong with Eddie's original renders, including the presence of the lines on the hour markers which I think add a great deal of distinctiveness to the dial design. I would suggest that he would be well served ignoring every suggestion for tweakerage (except mine of course, which is not a suggestion to tweak but rather not to tweak!). Looks good. Prefer the 3 dial version - version A / VK67. Was Version A actually Version B originally? Not for me. I prefer the cleaner aesthetics (to me) of the all black dial, but I get that the grey sub dials are more legible. Agreed - the usual 'vernacular' is to have time function hands in white and chrono function hands in orange/red, to differentiate - especially in watches carrying multiple sub-dials as well showing both chrono and time functions amongst them, but certainly the chrono hands need to be 'matched' similarly I'd think; although like the Speedmaster 376.0822, EZM1 and Kobold 323, all white can still work and has an advantage (EZM1/Kobold) that the chrono function is luminous as opposed to most other chronographs which can't be used in darkness. 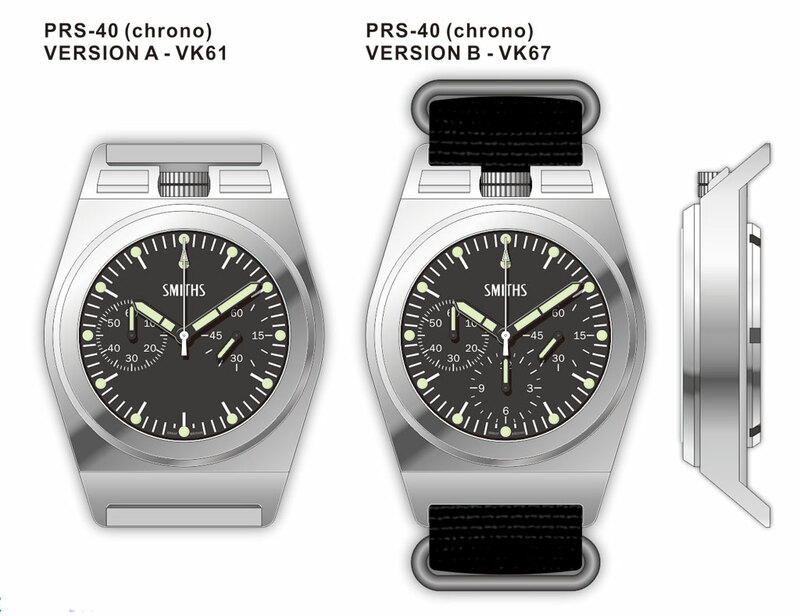 Paolo's project and the new 5100 replacement movements by Sinn, Damasko and Tutima seem to indicate that the notion of the centre-minute chrono is still a valid one. Last edited by andy111s; 15th September 2018 at 14:11. As you and I both know, the death of the L5100 was a piece of pointless stupidity, there simply is no more legible chronograph. Ive been wearing the A13-A for a couple of weeks now, and it is a great watch, only slightly let down by its lume. But, I think Eddie has his mind set on a Compax or Uni-compax doe this one, which is fair enough. I agree, though an alternative might be the inverse. Surprised me really as most people ramble on about busy dials on Breitlings, while I find them fine, but this is (to my eye) a case of trying to squeeze too much into too little area.